This is the sight which greeted me when I walked in the garage the other day. Not good. Our mountain bike rack had detached itself from the wall bringing two bikes down with it, right onto the car. Luckily the car had a cover on it, so it didn't receive any scratches beyond a couple which didn't go through the paint. The main damage was the dents caused by one of the bike's front forks impacting on the rear wing. Also the aerial was bent at the base, as it seems that took a lot of the weight of the bikes, sending them back down to the floor and possibly saving the rear glass. The options for repair are either take it down to a bodyshop or see if the dents can be removed by one of the Paintless Dent Repair outfits. As the dents haven't broken the paint and are pretty shallow, I'm hopeful that the latter will bring the bodywork back to normal. 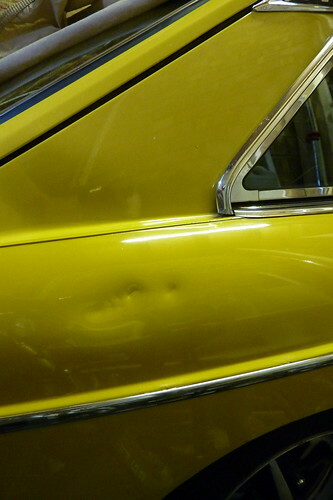 Anyone know any good dent repair places in the Teesside area? UPDATE: Had a recommended dent repair chap out to the car and it looks like they won't be able to help. Apparantly the dents are too sharp and a faultless repair is not possible. So it looks like it will either be a body-shop job or me doing some work with some filler.